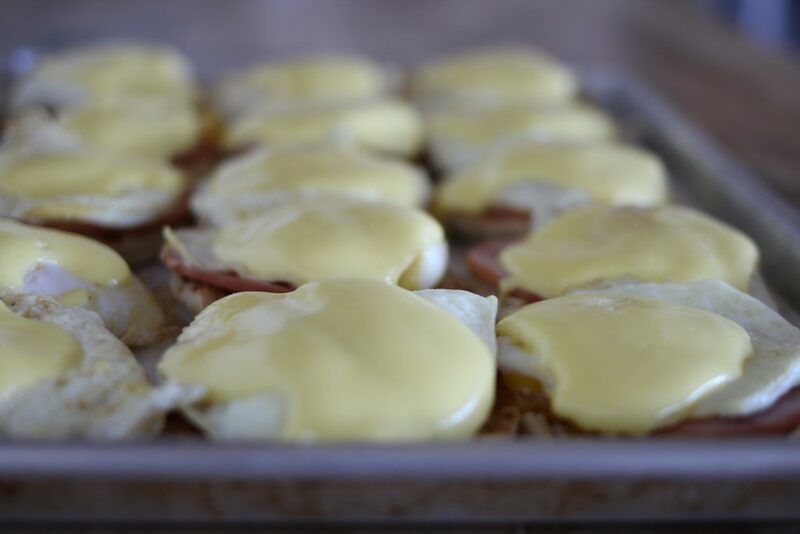 The story of Sheet Pan Eggs Benny with Simple Blender Hollandaise Sauce: Last weekend, we had a little gathering at our home for Grant’s Sunday school class. 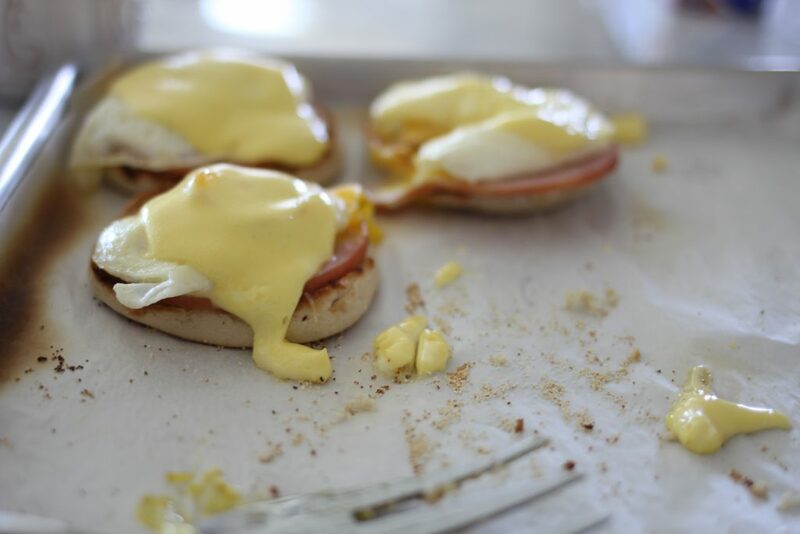 I wanted to make something everyone would love, and what better choice than Eggs Benny?? But Eggs Benny for a crowd? I decided the only way to do this was in a sheet pan. 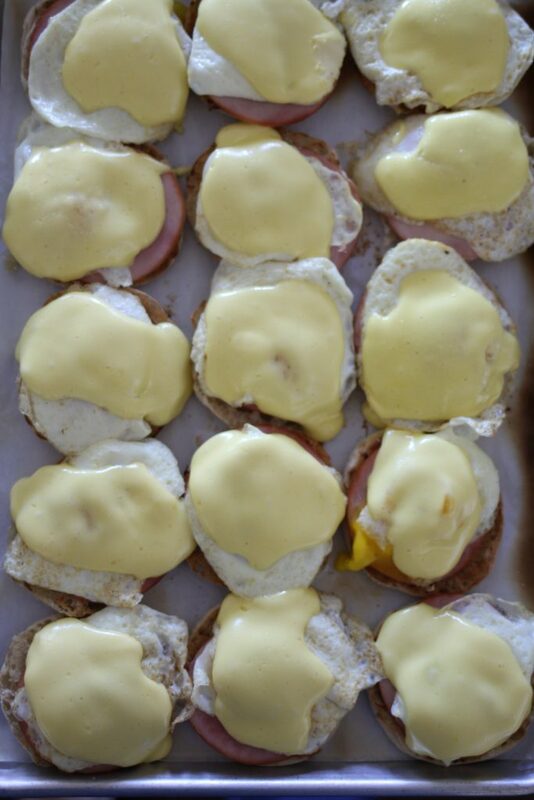 A trip to the grocery and I was loaded up with English Muffins, Canadian bacon, eggs, fresh lemons and butter. 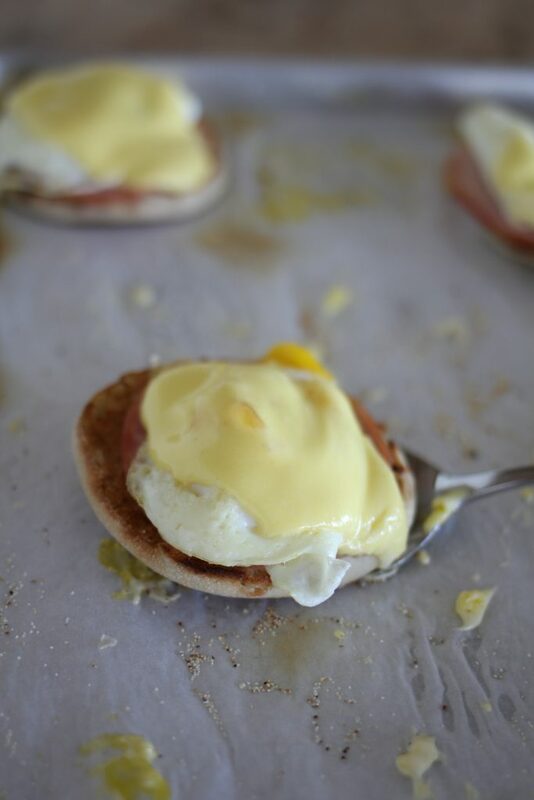 All of the essentials for classic Eggs Benny. But how to make this dish do-able for a crowd? I tried a few methods before coming up with a winner. First, I tried just stacking the Canadian bacon on the English muffin, but it was too soggy after baking. Next try, toast the muffin, but that took too much time (to toast 15 halves), so I simply laid the muffins out on a sheet pan, on top of parchment paper and lightly buttered the inside of the muffin for flavor and better browning, and then set the oven to broil. I have a love hate relationship with the broil setting, I’m guessing you do too! I was able to successfully broil the pan of English muffins but decided it was easier to just bake the pan for a few minutes while cooking the eggs. In the end, the steps were simple: toast the bread, lay out the meat, cook the eggs while bread is baking, bake the assembled muffins for a few minutes to keep warm while whirling the sauce together, top with sauce and FEAST! Start to finish, about 30-40 minutes ( I doubled this recipe) and enough to feed a big hungry group of teenagers. I’ll share the Overnight Blueberry Bake with Vanilla Sauce later this week. I also served this with a fruit platter and lots of chocolate milk. 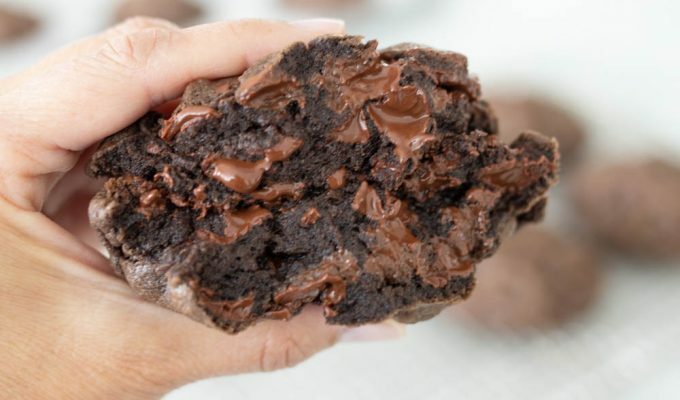 Pease read ENTIRE recipe before beginning! Set the rack on the top third of oven. Preheat oven to 350 degrees. Remove the Canadian bacon from the fridge, set on counter. Separate the 6 egg yolks and discard the whites (for the Hollandaise sauce), Place the yolks into a small bowl, set aside. Place a sheet of parchment paper on the sheet pan, or spray generously with cooking spray. I highly recommend parchment paper! Split the English Muffins and place onto the sheet pan, inside facing up. Lightly butter the inside of the English muffin. Place the pan of muffins into the oven to bake. Cook the English muffins for about 12-15 minutes until toasted (they do not have to be browned). When the muffins are cooked, remove the pan of muffins from the oven and top each with a slice of Canadian bacon and a cooked egg. .
Cook the eggs while the muffins are in the oven. Using a teflon pan, turn the heat to medium high. Spread a bit of butter in the pan. Crack eggs into the pan, 4-6 eggs to a 12 inch pan. Turn the heat to medium. When the egg whites start to cook and turn opaque, sprinkle the eggs with salt and add about 1/4 cup of water to the edge of the pan and put a lid on the pan. Do not pour the water directly over the eggs, just around the edge of the whites. Cook until the egg whites are set, about 1 minute with lid on, but the yolk is still very wet. The eggs do not need to be turned using this method, the steam from the water will cook the eggs. 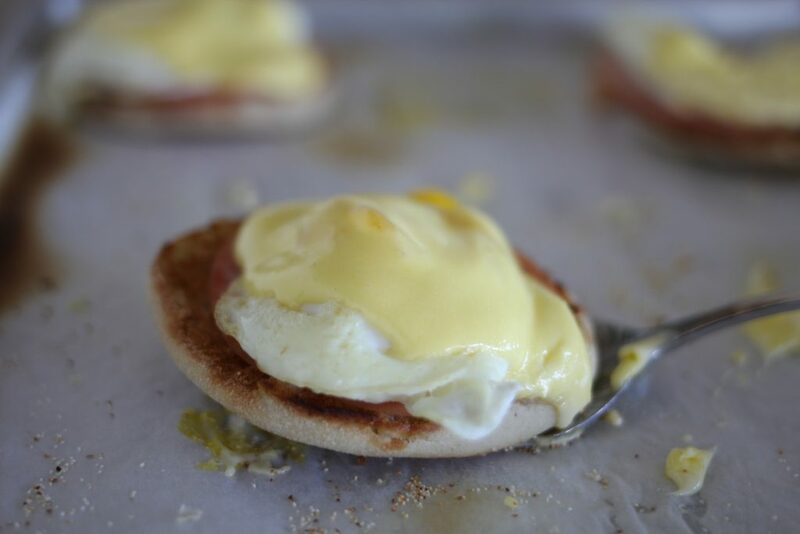 Using a spatula, remove the eggs carefully and place on a plate until ready to transfer to the English muffin. OR, simply fry the eggs slowly in a teflon pan over medium heat until the eggs are barely set (over easy eggs) turn egg carefully and cook for about a minute on the opposite side. Remove from pan or griddle onto a plate until all of the eggs are cooked. 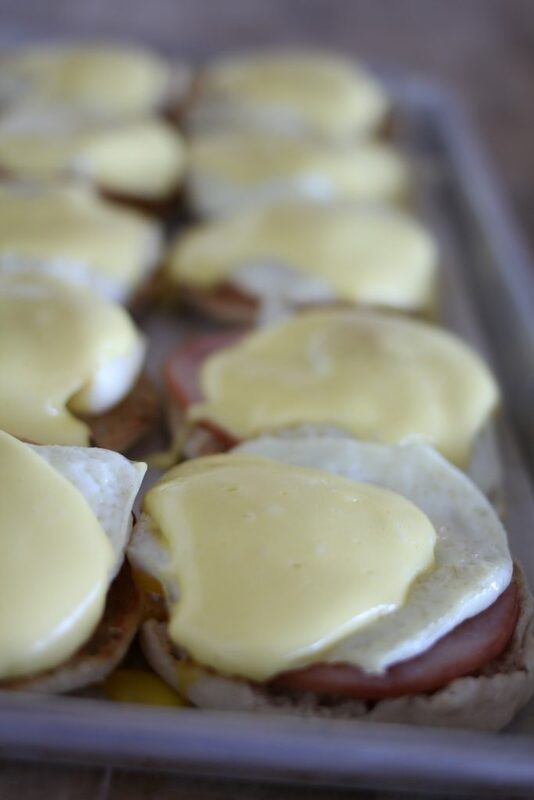 When all of the eggs are cooked in batches, and placed on top of the English Muffins and Canadian bacon, set the pan in the oven for about 5 minutes to keep warm. The oven should be turned off, but still be hot from toasting the bread. While the pan is in the oven, make the sauce. In a blender, combine the room temperature egg yolks, fresh lemon juice and hot pepper sauce. Cover, and blend for about 10 seconds. Place the butter in small pan over medium heat. Heat butter in pan until it bubbles and is hot, but not browned. Turn the blender on high speed, and pour the butter into the egg yolk mixture in a thin stream. The mixture should thicken almost immediately. If the mixture thickens too much, add a teaspoon or two of very warm water while the blender is on. If needed, keep the sauce warm using method in note section of this recipe. Tips for the sauce:-If using immediately, spoon the sauce out onto the eggs. If not using right away, scrape the sauce out into a small bowl, and set the bowl in a larger bowl of very warm water (nest the smaller bowl into the larger bowl, similar to a double boiler pan).The bowl of warm water should not be too full. If the bowl of water is too full it will spill over into your sauce!Do not put the sauce in a double boiler with boiling water or the eggs will curdle. Do not microwave the sauce. 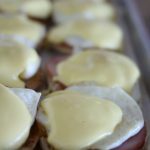 Tips for the eggs and Canadian Bacon:-I did not heat the Canadian Bacon on the griddle, it tends to dry out the meat and make it tough. -When cooking the eggs, I like the steaming method described because the edges of the egg are white and do not have a fried appearance. I cooked the eggs so they were barely at the over-easy stage. Remember, the eggs will also be heated a bit in the oven, so you'll need to compensate for additional cooking time in oven. It is essential the yolk still be soft when the dish is ready to be served!-We served about a dozen kids, they ate up: one pan of Sheet Pan Eggs Benny (one recipe) , one 9x13 of the Overnight Blueberry Bake, a large bowl of fruit, and about 1 1/2 gallons of chocolate milk. I thought the kids would each eat two halves of the eggs, but most only took one. It was a mixed boy-girl group.